30 Day "Free Trial" & Instant "Open Account"
A word of explanation so that our "30 Day Free Trial" may be clearly understood. There is NO RED TAPE involved. It is yours for the asking. Simply call us at 1-800-527-1522 and tell us that you want a certain product on a "30 DAY FREE TRIAL." We will invoice you for the products that you want to try. Your invoice will be marked "30 Day Free Trial." You may use the products for 30 days in any way you need to use them. If you are not satisfied with them at the end of 30 days, just return them to us, and we will give you full credit. You do not have to get a "return authorization." Simply send the product back with a brief explanation note. After 30 days, if you decide to keep the product, you do not have to notify us. You will have another 30 days to pay for it. In effect, you're getting 60 days open account on the FREE TRIAL. 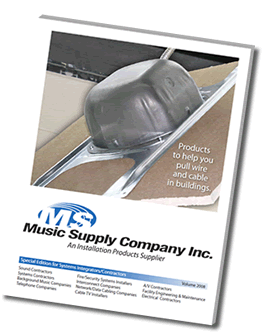 Music Supply Company Inc. has operated this FREE TRIAL OFFER for over 20 years without a complaint. It is simply our way of getting our products into your hands so you can evaluate them in actual work conditions. It has worked for literally hundreds of companies - let it work for you. Won't you join our fast-growing list of satisfied customers? The 30 Day Free Trial applies only to products manufactured by Music Supply Company Inc. and may be cancelled without notice.